Waterloo strike against climate change Dedicated climate activists come out in the cold to urge change for climate justice. Megan Ruttan is concerned about the world that her now-five-year-old son will live in when he is older. As a member of several environmental organizations in the Waterloo Region including Rise Waterloo, Ruttan is trying to make the world a more habitable place for her son by working against climate change. 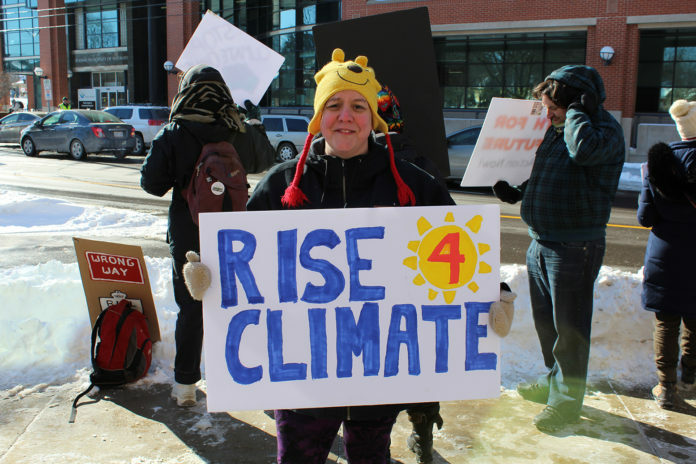 Ruttan helped organize the strike against climate change that took place on Feb. 1 in front of City Hall. She, along with co-organizers Mo Markham and Caterina Lindman, support youth in striking and becoming more involved in the fight against climate change. Sophia Kudriavtsev, a fourth year student in Sexuality, Marriage, and Family Studies at the University of Waterloo, was one of the strikers. “Today specifically, we’re demanding that the Region of Waterloo declare a climate emergency,” she said. Among the strikers, the general consensus was that climate change is a matter requiring urgent attention. “I see the impacts of climate change everyday and what I don’t see from our government is serious action … and recognizing that we need to take action now, or else we’re not going to have a chance,” Kudriavtsev said. “It’s our future and at the end of the day, our education doesn’t really mean much if we don’t have a planet to live on,” she said. Jodi Koberinski is a Ph.D. student at UW and was present at the strike. Other strikers confirmed that she is present at most of the strikes and continues to show her support. Koberinski has been working against climate change since the 1980’s, and she recognizes the urgency of the situation as well. “What folks are starting to realize is that it’s not about picking a better strategy or coming up with some new engineering or some other way around the problem. At the root of the issue is global corporate capitalism that commodifies life at the expense of all other values. Students around the globe, who are teenagers get this stuff,” she said. Maddy, a grade 12 student in Cambridge, was one of the students present at the strike. She and her friend Shayna are both heavily involved in activism against climate change. “It’s our generation now — we’re the ones that have to fix it now,” she said. In particular, strikers were concerned about recent advances in fossil fuel infrastructure, namely Bill 66 and pipelines. “Our country is still going ahead with fossil fuel infrastructure in a really big way, including the pipeline that we just bought. We’re going in the exact wrong direction for this. We need to rapidly start turning this around and we have ten years to do that,” Ruttan said. Strikers recognize the need for action at any and all levels. They also stated that people can no longer rely on government leaders to listen to their concerns. They have to make themselves heard. “The one thing that I really want to see is this happening on an international level. Municipalities are talking more about what we can do,” Kudriavtsev said. Koberinski stated that there needs to be a change in the way that we view climate change and its possible solutions. She recalled some of the words said to her by Dr. Vandana Shiva, a board member of the International Forum on Globalization and activist for many causes. “It’s not about winning. The outcome isn’t about saving the planet or making it hospitable for humanity. It’s the minute you know there’s an injustice and there is suffering, it is your job as an able-bodied person to do something about that suffering and injustice,” she said. The School Strike for Climate is modeled after the efforts of Swedish student Greta Thunberg, who protests outside government buildings regularly. This strike will take place on the first Friday of every month. An information session against Bill 66 hosted by Grand River Environmental Network, in conjunction with other environmental organizations, will take place at the First United Church on Feb. 7.